Hello Candidates, We have a Good news for all the candidates who could not appear for the AFCAT 2 2017 exams exams because of some incidents in some part of the country so Indian Air Force have decided to take Supplementary test for the absentees on 17th September 2017. For more details checkout the complete article below to know in details regarding AFCAT 2 2017 supplementary tests. In order to afford another opportunity to those candidates who could not appear in AFCAT 02/2017 at any one of the 14 centres identified in Haryana and Punjab, on 27 Aug 2017 due to the then prevailing security unrest, Indian Air Force has planned a supplementary AFCAT on 17 Sep 2017 (Sunday). The 14 exam centres are Ambala-1 & 2, Adampur-1 & 2, Amritsar, Barnala, Bhatinda, Chandigarh- 1,2,3 & 4, Halwara, Sarsawa and Sirsa. Candidates assigned to one of these 14 centres, who could not appear for the AFCAT 02/2017 on 27 Aug 2017 and wish to appear for the supplementary exam, are to report to their previously allotted exam centre at the time specified in the Admit Card (any change in the address of the centres or time will be notified separately through email/ SMS). required to be forwarded by a date not later than 10 Sep 2017. Requests received after this date will not be entertained. Name of the place, exact address of the centre and time of reporting will be notified separately through email/ SMS. No fresh admit card will be issued for the supplementary test. No request from candidates for change of centre will be entertained. Candidates who wish to appear in the supplementary test should be in possession of the Admit Card already issued, with original ID proof for verification and a copy of notification received through email. All other instructions as given in the Admit Card are to be strictly adhered to. Candidates who have already appeared in AFCAT 02/2017 are not eligible for the supplementary test, and should not attempt to appear again which may lead to cancellation of candidature. 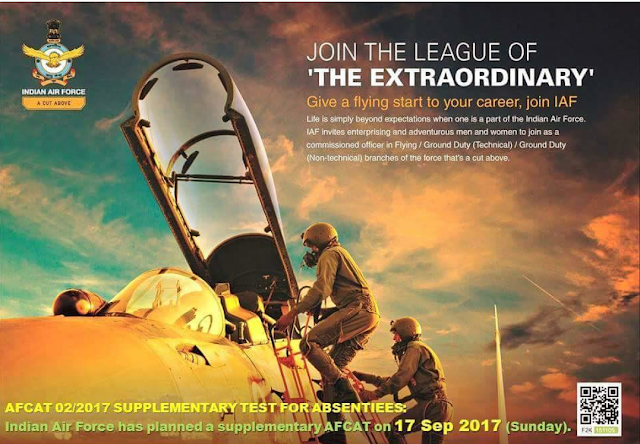 So this was all about AFCAT 2 2017 Supplementary Test for Absentees [17th SEPT 2017]. Hope now you would be aware of the re exams for the absentees.Candidates need to checkout the details carefully and re appear for the exams. Feel free to ask questions regarding AFCAT 2 2017 Supplementary Test for Absentees [17th SEPT 2017] in the below comments.